Arviot asiakkailta majoituspaikassa Katamah Guesthouse yöpymisen jälkeen. Katamah Guesthouse: Varaa yöpymisesi huippuhintaan – arvosana 9,4 muilta matkailijoilta. The location was on the beach front with easy access. There was a communal kitchen area with honesty box for chilled drinks and snacks. There was complementary tea, coffee and fruit. Cooking facilities with cooker, oven. microwave and toaster enabling you to self cater. The gardens were well looked after and attracted many birds.The outdoor seating and lounging areas were clean and comfortable providing great views of the beach and sea. The hosts and staff were very welcoming and provided a wealth of local knowledge from history to the best places to eat and visit. This place is a must if you are staying in Treasure Beach... absolutely stunning and beautiful. So peaceful and relaxing. You are right on the beach with all the amenities needed. I am definitely going back and have made it my new home in Treasure Beach... Thank you Moannie and Joannie for making me feel so welcome. 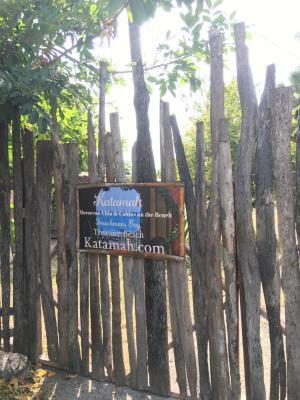 I loved staying at Katamah - it was in a great location, and Moni and Simon were great hosts. The rooms were a good size, and nicely decorated and the general atmosphere of the place was laid back while also combining really good hospitality. I would recommend staying there to anyone! The place has a lovely, relaxing ambience, is comfortable and friendly. The owners greet and are always on hand to help and advise all of their guests. They have the very best spot on the beach. Lots of nice places to eat and drink nearby. Walks along the shore too ! The best on Treasure Beach! There is room in the tent and the bed are really comfortable. Perfect location direct on the beach. Beautiful sunset and dolphin watching. The location, the friendliness of the proprietors, the facilities and the accommodation. The owners were great and have really made the place special. The room was spacious and we loved the outside shower. There was also a kitchen for communal use. Would definitely stay again. Bed very comfortable. The family keeps the place in harmony with the environment and very attentive to details. 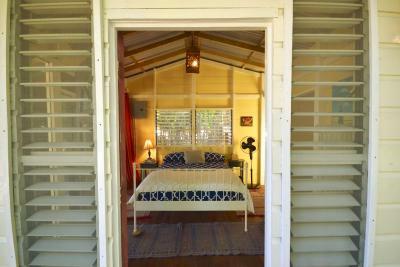 Set in the south coast of Jamaica, this guesthouse is located on the beachfront of Frenchman's Bay, in Treasure Beach. 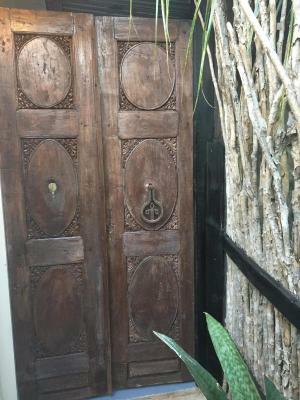 Katamah Guesthouse offers artfully decorated rooms with free Wi-Fi. Full linen and towel service is also included. 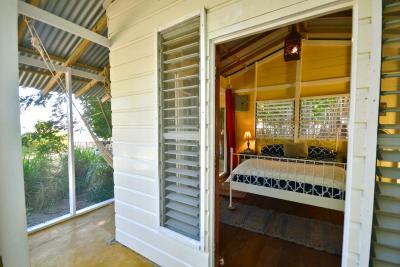 The property is comprised of villa rooms and cottages with garden views, as well as sea view cabins and family suites. Katamah Guesthouse also offers camping. Katamah guests share the central kitchen and beachfront outdoor living room. 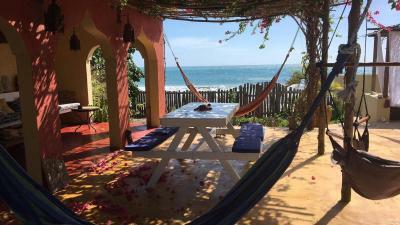 The guesthouse offers trips to the rustic-wooden Pelican Bar built in the sand in the middle of the ocean and to the Black River known for its unique mirror-like waters. 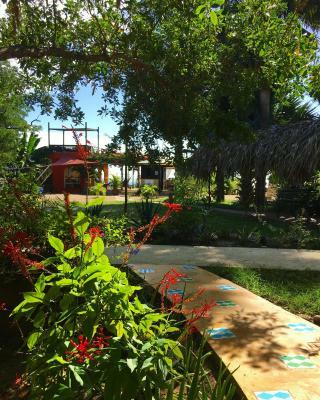 Katamah Guesthouse also features guided trips to Appleton Rum Factory. Pedro Bay is 10 minutes’ drive away from Katamah Guesthouse. Kingston town centre is 3 hours’ drive away and Jamaica International Airport is 90 km away. Tämä majoituspaikka on yhdellä parhaiksi arvioiduista paikoista kohteessa Treasure Beach! Asiakkaat tykkäävät tästä paikasta enemmän kuin muiden majoituspaikkojen sijainnista. Tässä majoituspaikassa saat arvioiden mukaan parasta vastinetta rahoillesi kohteessa Treasure Beach! Asiakkaat saavat samalla summalla enemmän kuin muissa majoituspaikoissa. Katamah Guesthouse on toivottanut asiakkaat tervetulleeksi Booking.comissa 28. elok. 2012 lähtien. Milloin haluaisit yöpyä majoituspaikassa Katamah Guesthouse? 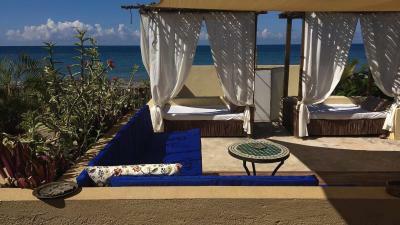 This beautiful room is in the Moroccan Villa and features ocean views and a private shaded terrace. There is also a king-size bed and a tiwn bed in a separate area. 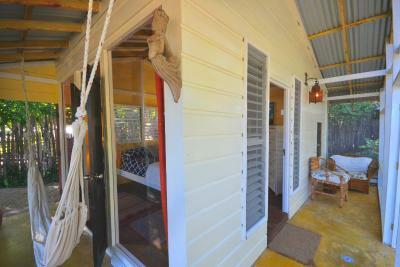 It offers free Wi-Fi and a private bathroom with a hot outdoor bamboo shower. Daily housekeeping and breakfast service are available upon request for all guests. This suite is the only one located on the second story and features a huge balcony with amazing views of the Ocean and mountains. It also offers a private bathroom with shower and hot water. Free WiFi is included. Mukavuudet: Katamah Guesthouse Mahtavat mukavuudet! Arvioiden pistemäärä on 9,1. Talon säännöt Katamah Guesthouse ottaa vastaan erikoistoiveita – voit lisätä sellaisen seuraavassa vaiheessa! Katamah Guesthouse hyväksyy nämä kortit ja pidättää oikeuden tehdä kortiltasi katevarauksen ennen saapumista. Ilmoitathan majoituspaikalle Katamah Guesthouse etukäteen arvioidun saapumisaikasi. Voit kirjoittaa sen Lisätietoja-kohtaan varausta tehdessäsi tai ottaa yhteyttä suoraan majoituspaikkaan. Yhteystiedot löytyvät varausvahvistuksesta.